The Delta Hybrid range of rotary lobe compressors are used in many key industrial production processes. Its design is based upon efficiency. It is estimated that about 90% of the costs incurred over the lifecycle of a compressor are for the energy it consumes. This presents a huge cost and must be faced in designing for competitiveness and ecological sustainability of a process, in the global arena. For these reasons, AERZEN has focused on making compressors that are energy efficient, saving up to 15% of energy costs. This magnitude of energy reduction means that the return on investment for a machine in this range is 100% within just two years, depending of course upon the volume flow and pressure levels required in the workflow. This epitomizes the outstanding features of the Delta Hybrid. The Delta Hybrid is a cutting-edge rotary lobe compressor which combines the best of the rotary lobe blower and the screw compressor, thus generating pressure or vacuum in a highly innovative manner with the benefits of both approaches in one. 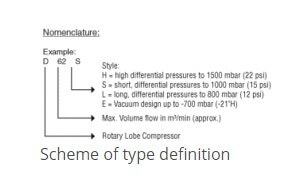 Low pressure is created by the Roots principle which calls for isochoric compression, while the generation of higher or positive pressures requires internal compression which is most successfully applied by the screw-type compressor. The two-in-one unit is packaged with all required components as standard because of the success of its renowned predecessor, the AERZEN Delta blower and Delta screw compressor, with even better design. Negative pressure: It can achieve up to -700 mbar. 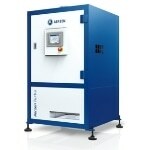 Positive pressure: It can produce up to 1500 mbar pressure. 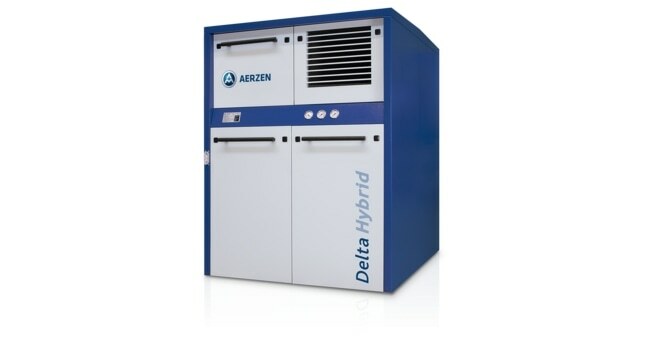 The Delta Hybrid range allows operators to handle it easily and requires minimal maintenance, which has a positive effect upon the profitability and efficiency of the process. This is traceable to the design features which AERZEN focused upon while developing these machines, resulting in a range of compressors which are user-friendly and bring smiles at the sight of a healthy bottom line. 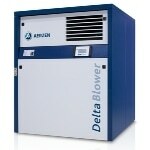 The Delta Hybrid achieves up to 15% savings on energy consumption. It offers a control range between 25% and 100%. Its use leads to reduced losses of pressure and air flow. It uses advanced IE3 engines which are of premium performance. It features a belt drive which helps ensure precise volume flow. The Delta Hybrid extends the range of applications to positive pressures of up to 1500 mbar and vacuums of up to -700 mbar. It can handle outlet temperatures from 160°C to 230°C. 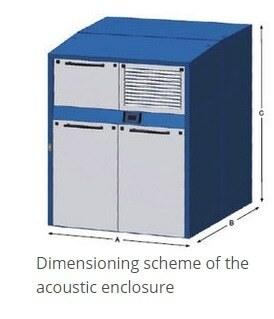 The absence of absorption material in this compressor means that the noise level is reduced as the discharge muffler redirects process air rather than the absorption material. Also, the air rerouted is free of this material and therefore free of contaminants, which is an important consideration in the food industry, for instance. It is certified as a spark extinguisher in compliance with ATEX specifications. The Delta Hybrid has a sturdy construction and its patented bearings help to give it a lifespan of over 60 000 hours when functioning at differential pressures of 1.000 mbar. Its driving chamber and conveying chamber seals are also patented for long life. Its operation is completely oil-free and therefore class 0 as per ISO 8573-1. 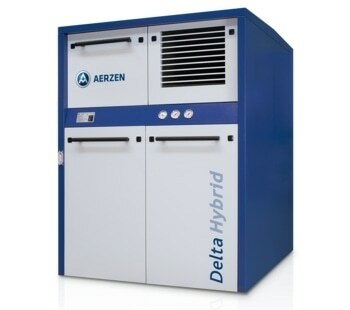 In short, the Delta Hybrid lends itself to use in many industrial processes, especially when they require for air or neutral gases to be conveyed in an oil-free manner. It is available in nominal sizes ranging from DN 100 to DN 300 for both negative and positive pressures. Many other applications are also coming up in new fields.